The BCCLA believes that Canadians who are suffering unbearably at the end of life should have the right to choose a dignified and peaceful death. The BCCLA filed a lawsuit in 2011 to challenge the laws that criminalize doctors for helping competent, seriously ill individuals who wish to hasten death. Our death with dignity lawsuit argues that the right to control when and how to die is integral to the life, liberty, and security of seriously ill Canadians. After a four-year legal struggle, on February 6, 2015, we won a historic victory on behalf of all Canadians who need choice at the end of life. After a request for extension, the Supreme Court delayed the effect of its ruling until June 6, 2016. Now, the federal government has put forward proposed legislation that would only apply to individuals whose death is “reasonably foreseeable”. BCCLA’s client at the heart of the Carter case, Kay Carter, who suffered from spinal stenosis which left her in prolonged agony but would not kill her, would be barred from accessing medical assistance to die. At every turn, this government has been told by leading constitutional and medical experts that this bill was unconstitutional, violates Charter rights, and would condemn sick and suffering Canadians to return to court one day soon.The government refused to listen. On June 16, 2016 the House of Commons rushed to vote through Bill C-14, rejecting the thoughtful amendments of Senators, and foisting a deeply flawed bill onto the country. The BCCLA and all the families and clients we have worked with are deeply disappointed by this turn of events. We are considering our options for how best to continue our fight to protect an individual’s right to autonomy at the end of life.. Stay tuned to our email list (sign up in sidebar, or below on mobile) for the latest updates. This TedxStanleyPark talk by Grace Pastine, BCCLA Litigation Director, explains the Supreme Court of Canada’s decision and the challenges ahead. This video is an introduction to some of the people behind this case, and to the reasons why the BCCLA, along with our clients and supporters, are so committed to this issue. Our great thanks go out to filmmaker Kevin Eastwood and his team for making this piece for us. Canadians who suffer from diseases such as terminal cancer, Huntington’s disease, and multiple sclerosis should be able to choose a compassionate death. They also deserve the peace of mind and improved quality of life that comes with knowing that should their suffering become intolerable, a peaceful and dignified physician-assisted death will be an available choice. We believe that where deeply personal choices regarding end of life care are involved, the patients themselves should make those decisions, not the government. Patients have a right to accept or refuse medical treatment – for example, a patient can refuse kidney dialysis, or mechanical ventilation, even if that choice leads to death. It is not the role of government to say that some medical choices result in a “natural” death, while others do not. The current laws force seriously ill Canadians to resort to violent methods or the “back alley.” Tragically, people find ways to end lives that have become unbearable, no matter what the law says, even if that means choosing a violent, risky death. Regulation of choice in dying, rather than the criminalization of doctors, provides the best protection for seriously ill Canadians. It has been 20 years since the Supreme Court of Canada heard Sue Rodriguez’s plea for justice. Ms. Rodriguez suffered from ALS and asked for the right to choose how and when to die. In a divided 5-4 decision, the Court upheld the law that criminalizes doctors for assisting the sick and dying to have choice at the end of life. Since that time, there has been a sea change in social thinking on these issues. Many countries such as Belgium, Luxembourg, the Netherlands, and the states of Oregon and Washington, now allow for assisted dying. These programs have been rigorously documented and studied. Their experience reveals that the fears are unfounded. It’s time for Canada to adopt a new approach to dying that respects compassionate choice. Gloria Taylor was an active, independent 61 year-old when her doctor told her she had ALS. The doctor told Gloria that the disease would likely paralyze her within six months, and would kill her within a year. Gloria outlived that – she survived three additional years. During that time, she waged a public fight to die on her own terms. She was the lead plaintiff in our lawsuit. 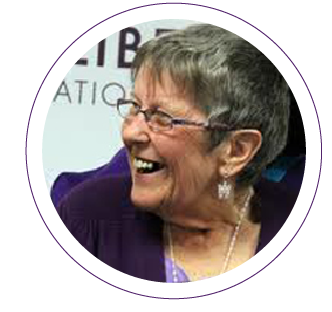 With the help of the BCCLA, Gloria became the first Canadian ever to win the right to ask a doctor for help in dying. When we called Gloria to share the news of her legal victory, she cried, “Thank you, God.” Holding up a cup in a toast to her late friend who died agonizingly from ALS, Gloria added, “This one’s for you, Peter. We bloody did it!” In the end, Gloria did not have to ask a doctor for help to die peacefully. She died suddenly and unexpectedly from an infection in 2012. Gloria’s family members, including her 85 year-old mother, Anne Fomenoff of Castlegar, B.C., and her eldest son, Jason Taylor, of Kelowna, B.C., have continued Gloria’s crusade. Lee Carter and Hollis Johnson, a married couple of Roberts Creek, B.C., are also plaintiffs in the lawsuit. Lee and Hollis accompanied Lee’s 89 year-old mother, Kathleen (“Kay”) Carter to Switzerland in January 2010 to end her life. 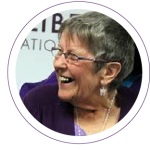 Kay suffered from spinal stenosis, a degenerative condition that confined her to a wheelchair, unable to feed herself or go to the bathroom without assistance and suffering from chronic pain. Kay was fiercely independent and determined to leave life on her own terms. Because she had to keep her plans to receive assistance in dying a secret, Kay could not even risk saying good-bye to many of her loved ones. Elayne Shapray of Vancouver, B.C. joined the BCCLA’s legal fight in 2011 when she provided a personal affidavit in support of the lawsuit. Elayne was one of numerous seriously ill Canadians who stepped forward to share their deeply personal stories with the courts. The case is a matter of extreme urgency to Elayne who suffers from the late stages of multiple sclerosis (MS). Elayne is a 67-year-old grandmother and wants the right to have a physician-assisted death before she becomes trapped in her body. The BCCLA filed a lawsuit to challenge the laws that make it a criminal offense to assist seriously and incurably ill individuals to die with dignity. The lawsuit claims that the laws are unconstitutional under sections 7 and 15 of the Canadian Charter of Rights and Freedoms because they deny individuals the right to have control over choices that are fundamental to their lives and prevent unnecessary suffering. The laws restrict the liberty of physicians to deliver compassionate end of life care to incurably ill patients. The laws deny equality to the physically disabled by criminalizing a choice – the choice end suffering through suicide — that is available to the able-bodied. The B.C. Supreme Court heard the trial of the case over 23 days. The court heard the case as a modified summary trial. Evidence was presented through affidavits; however, the parties could require deponents to attend for cross-examination either outside of court or at trial. Over 116 expert and lay affidavits were filed (85 of those were filed by the BCCLA). Some of the affidavits ran hundreds of pages in length and attached voluminous secondary sources. Eighteen affiants were cross-examined; of those, the parties examined 11 before the court. The B.C. Supreme Court ruled that the criminal laws against assisted dying violate the rights of the seriously ill and are unconstitutional. The court gave Parliament one year to rewrite the laws. Our lead plaintiff, Gloria Taylor, became the first person in Canadian history to be granted the right to seek a physician-assisted death. 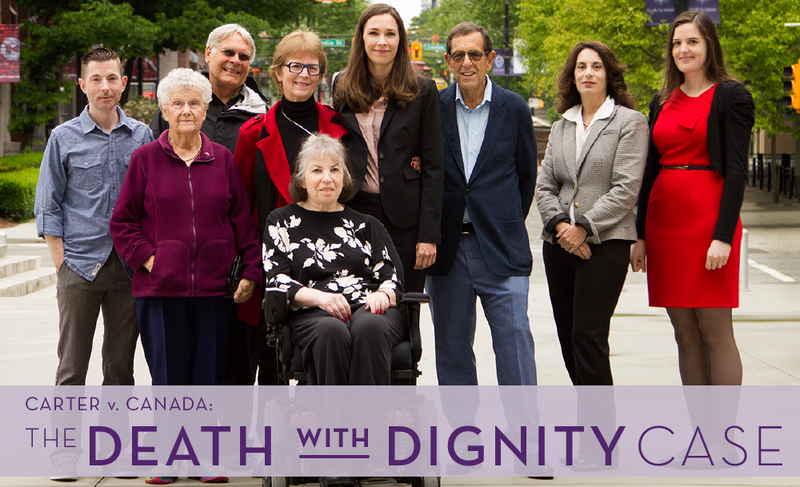 The BCCLA, our clients, and supporters of the right to die with dignity, celebrated a momentous turning point in Canada’s approach to compassion and choice at the end of life. The federal government announced that it would appeal the B.C. Supreme Court ruling. The B.C. Court of Appeal heard the appeal of the case. In a divided two-to-one decision, the B.C. Court of Appeal overturned the historic BC Supreme Court ruling. The majority of the court did not base its decision on the merits of the case. Instead, it decided that it could not reverse the Supreme Court of Canada’s 1993 decision in Rodriguez v. B.C., effectively leaving the case for the Supreme Court to sort out. The Chief Justice of B.C. dissented, agreeing with the BCCLA that the laws were unconstitutional and that the evidence since Rodriguez shows that safeguards can be created to protect vulnerable individuals. The BCCLA filed for leave to appeal to the Supreme Court of Canada. The Supreme Court of Canada announced it would hear the case. The Supreme Court of Canada is scheduled to hear oral arguments in the case. After decades of work on the issue, and years in the lower courts, the BCCLA and our clients will take our fight for the right to die with dignity to the highest court in the country. In a unanimous decision, Canada’s highest court affirmed that the criminal prohibition against physician assisted dying is an infringement on the Charter rights of Canadians. The Supreme Court allowed Parliament and the provincial legislatures 12 months to enact new legislation that upholds these fundamental human rights. The Court made it clear that no level of government was required to enact legislation. We did it! With less than a month to go before this decision is finally implemented, the federal government has requested another six month delay. The BCCLA will appear before the Supreme Court on Monday, January 11, 2016 to fight this extension.